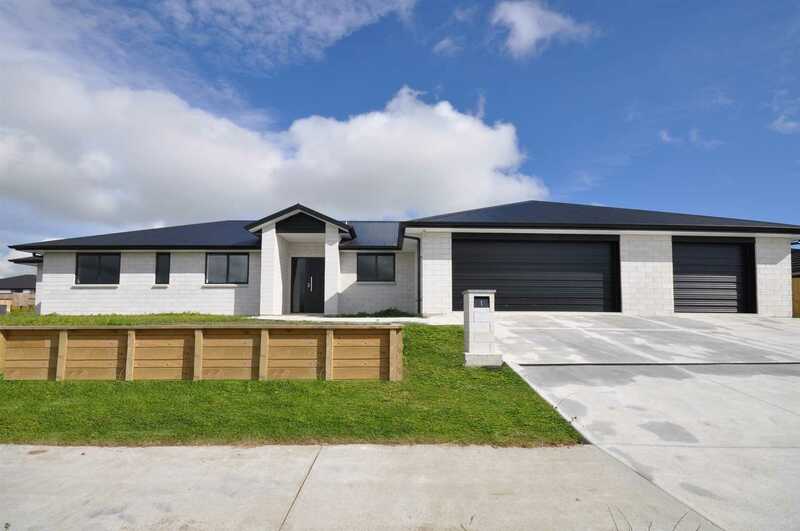 Sitting eloquently on an elevated corner is this pristine brand new home in sought after Morrinsville's Parkwood subdivision. Great care has been taken in the planning and build of this large home - there is something for everyone. You will be impressed from the moment you step through the front door into the large entranceway. Heading through to the open plan living areas, the kitchen is the hub of the home with all the mod cons including a scullery and breakfast bar. The living/dining and separate lounge or family room opens through stacking sliding doors to a magnificent deck which soaks up the afternoon sun - perfect for entertaining. The master also opens out to this deck and is completed with an ensuite and walk-in-wardrobe. There are a further two bedrooms, with wardrobes which are serviced by a separate toilet and a family bathroom. Separate office and laundry are also on offer here and last but certainly not least, internal access to the timber lined TRIPLE car garage, with extra storage cupboards. Be the envy of all of your friends in this beautiful home. It won't last in the new year market, so don't delay, call John or Danielle to view today.